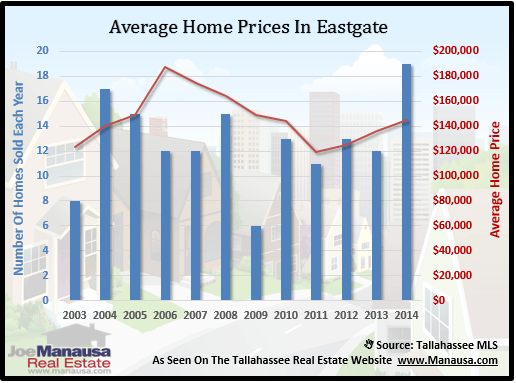 Located in Northeast Tallahassee, Eastgate offers prime location and median priced homes. Convenient to shopping and quick access to both the Interstate and Capital Circle NE, you can be just about anywhere around Tallahassee in less than 15 minutes from your home. 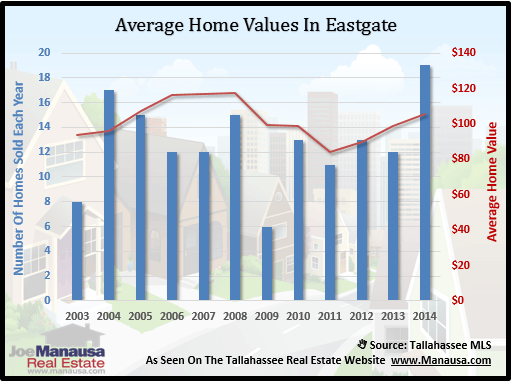 In this report, we will look at prices, values, and sizes of homes in Eastgate, as well as show current listings in the Tallahassee MLS and all closed home sales going back to 2002. For all of the real estate graphs found below, you will find the number of closed home sales for each year (blue columns, measured on the left vertical axis), and an important real estate statistic shown in red (measured on the right vertical axis. It is important to note that sales are through December for all previous years, but through mid October in 2014. Home prices rebounded strongly last year, and have continued higher this year. The average recorded sales price is $139,500 for Eastgate thus far in 2014. More importantly, the pace of home sales is very good and is likely to end the year as the best of the past ten years. Currently, there have been 13 closed home sales in Eastgate. Average home values in Eastgate have continued to rise, they currently are well above the 11 year low established in 2011. Through mid October, the average value of a home sold in Eastgate this year has been $103 per square foot. 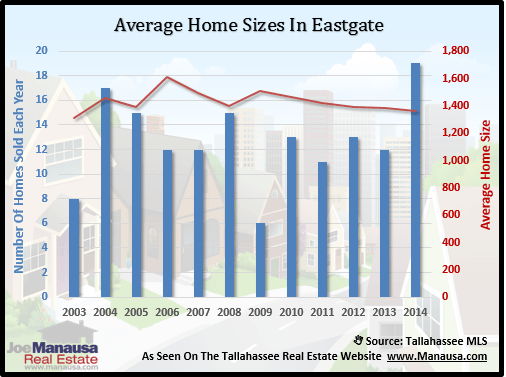 The average home size sold in Eastgate typically falls in a range of 1,400 to 1,650 square feet, but this year is the lowest on record at 1,359 square feet. I suspect the high demand for this great NE Tallahassee neighborhood has buyers jumping at any good opportunity that appears in the neighborhood. The following list shows home sales going back to 2002 in Eastgate. I hope you enjoyed our October 2014 update on home sales in Eastgate, please feel free to drop me a note if you have questions not covered in this report.